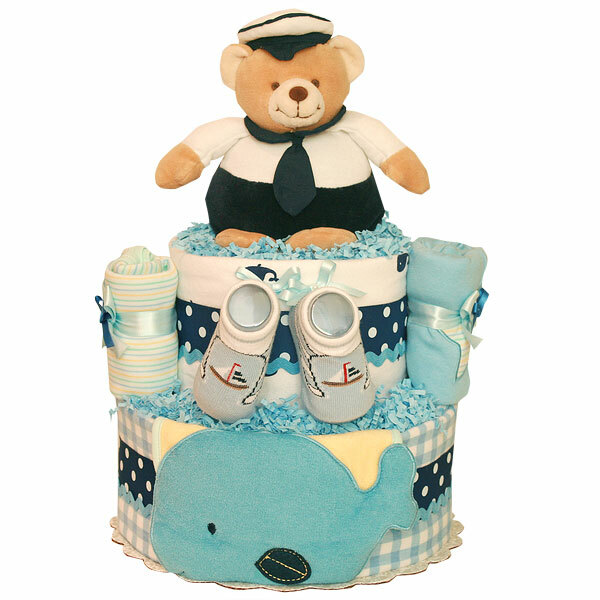 Practical and handmade two tiers Whale Bear Ocean Diaper Cake is made of 40-45 Huggies Little Snugglers diapers size 2 (12-18 lbs. ); two flannel receiving blankets 100% cotton; one pair of baby socks; one bear toy; one JOHNSON'S Baby Powder Pure Cornstarch with Aloe Vera & Vitamin E (Gently absorbs excess wetness to keep skin dry and soft) 1 1/2 oz; one baby whale outfit. Outfit is 3 pc. set (one bodysuit, pants and one bib). Decorated with coordinated ribbons, bows and pins.